It was a good weekend for LAVA on Saturday the Tsunami 14U team took the top spot in the Silver bracket. On Sunday Scorch 16U won it all finishing 1st in the Gold bracket. LAVA Scorch overcame a slow start to the day and won the 2019 LAVA Valentine Challenge in an exciting match with Nickel City 16's 12-25, 30-28, & 15-11. Nickel City defeated Scorch in pool play. To get to the finals Scorch bested Eastside Ice Tundra in 3 sets 20-25, 25-19 & 16-14. Congratulations LAVA Scorch. We have completed our team selection at this time. If you have not received an E-mail please contact us as soon as possible. If you were successful in making a team congratulations! The next step is to go back to the WEVAvolleyball.org site and upgrade your membership to full junior member if you registered as a tryout member. Once that is done we can add you to our roster. Please make sure that you get your tournament sheets turned in at your first practice. A payment of $215 is due upon making a team, click here to pay, or click on the registration button above. Please enter the player's name in the contact information. These fees cover uniforms, practice space and administrative costs. Once the final tournament schedule is determined, team specific payment links will be posted. Payments can be paid in full, or split up into three payments due in January, February and March. The Lava apparel store is up and running so you can share store/ordering information with your teams. The store never closes and apparel is shipped right to the player in 2 - 3 weeks. Click on the button below to see the store. If you have any questions, please contact Chris Butera. Power point presentation from the Parent meeting held 10/21/18. Please complete this informational sheet and bring it with you to tryouts. We start in November with practices. The season is usually over at the end of April. There is a tournament in May that some of the teams like to attend. No later that the 2nd weekend in May. Tournaments generally start at 8AM. It depends how well the team is playing. Pool play is generally done by 1PM then you get into playoff rounds. It could last until 6PM. Plan on spending the day. Plan on good snacks for and water for your daughter. Most venues have a concession stand. 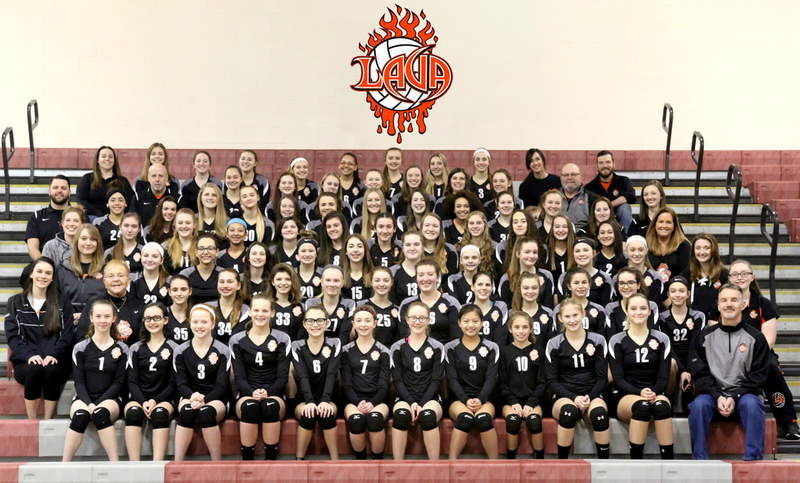 LAVA Volleyball was formed when parents of Livingston County teams were looking for a more local club that didn't travel outside of NYS, was reasonably priced and allowed their daughters to still participate in family functions, school sports and activities. We started with 2 teams in 2011 and have grown to seven teams this season. We are committed to bringing in the best coaches we can find and to give your daughters a great experience during the season. If you are interested in LAVA volleyball please contact us.